My parents have just pulled away. It was a fun, noisy, food- & laughter-filled 5 days of family coming & going through Easter weekend. Now that we’ve moved to a different city, these pockets of both familiar comfort and reacquainting are an important part to keeping me grounded in this new life. Sure, there are times when my brothers and I still rub each other the wrong way, but these first relationships remind me of where I come from, help me reaffirm who I am at my core and give me an extra glimpse at who I don’t want to become. Sometimes daily life can do that as well. The part about who you don’t want to be. You know, when you have those days that feel like life is living you: when the kids’ activities and work deadlines and the laundry…the shoulds are driving the boat, and it’s like you’re just being pulled along for the ride? At times like those, I can lose sight of my own values and needs, as they get trampled by the schedule. I know that I’ve fallen into that mode when I literally feel breathless adding one more item to my to-do list. My heart pounds like I’ve run a race. Like I’m scrambling to catch up with myself even though I’m not sure where I’m headed. When my sense of overwhelm is through the roof like that, I usually feel quite down on myself. OK, that’s putting it mildly. When stress gets the better of me, whatever self-confidence I have flies out the window and, depending on the day, anxiety or depression hook right in – I’m running on fear, a ball of insecurity. Inevitably, as stress will do, those are also times when my minor ailments (asthma and digestive woes) get a little louder, or I hurt myself with small accidents – a head bump on the cupboard door or a twisted ankle on the stairs. Though, of course, there’s no time to rest or see someone to help, because there aren’t enough hours in the day. I have a recurring dream of frantically packing or trying to find a cab for a flight to Paris that leaves in an hour. When that dream shows up, I now know it’s telling me to take the stressed-out foot off the gas and reassess. One thing that has become unfailingly clear when I take a step back on those days is that most of my focus is on the stuff that has yet to be done. Or the stuff that needs to get fixed because I did it wrong. Which only adds to the list, and the snowball grows. It took years of noticing to be able to catch onto that piece of awareness, but what to do about it? Thank Goddess for the circles I hang out in, and their penchant for soulful activities. Like my family, they are among the relationships that ground and remind me who I am, yet they also hold space for the woman I want to become. You see, the world of work and family and kids necessarily involves deferring to the other, looking outside for information. I mean, our role as women was all about keeping the tribe safe within the village, which meant a constant vigilant gaze while stirring the pot and tending the children, right? That’s great, but then we get stuck in that mode, forgetting that tribal life also involved a great deal of ritual – honouring and gratitude and allowing stillness in the ebb & flow of the days & seasons. So, we need to take time to turn back inward. In the 90s I used to hear people talk about “finding their edges” and I had no idea what they were talking about. That’s probably because I didn’t have a good sense, at the time, of who I was inside; my edges just blurred with those of others around me. Turning inward is more involved than simply putting your feet up and taking a break in the midst of the turmoil. As a matter of fact, if I try to take a break when I’ve got an overly full plate, it just stresses me out more as I sit there thinking of all the nitty-gritty details that will keep all the balls in the air. Turning inward needs a sense of ritual, in that it needs a deliberate intention. Perhaps it turns into a meditation practice or a daily gratitude journal or plain old journaling or affirmations. First off, a specific intention focuses your attention on something other than the list, which will truly allow your mind to rest. Like a good nap, you will have more energy to tackle what’s next. The effects of that rest then trickle down through your physiology, as the stress-induced chemicals wash away. Enter the reset of your mood AND your immune system given a fighting chance. The clouds will drift and you’ll spot some clear blue sky in your day. Turning inward also allows you to turn around, in a sense. Rather than obsessing over what you have yet to do, you can take a moment to ponder what you have done. How often do you complete task A, only to jump right into activity B? There are all those sayings about how the small steps lead to big changes, and you get that, you take the steps one at a time, but then you forget to look at the benefit it had. I see that with clients all the time: it’s been 2 weeks since her last appointment, she’s started to shift her habits, and she comes in telling me that her belly still bloats after certain meals. She completely bypasses the fact that her face hasn’t broken out or that she didn’t need the Advil this month. Taking that pause on a regular basis – daily, weekly, hourly if you need it – is a moment of celebration. Sometimes I feel like we’re all waiting for that perfect moment to celebrate. As if celebration can only be the cork-popping party at the end of the big deal, which you probably know by now, may never actually come. Goals and intentions are out there to lead us in a specific direction, and we can take whatever steps we learn and believe will get us there, however, we have no control over the actual outcome. In putting off the celebration, in only seeing the end result as the acceptable finish, we’re setting ourselves up for failure on a daily basis. And then we wonder where all the anxiety, depression and stress-related ailments come from! Which gets me to the point: I encourage you, I urge you, I implore you to take a breath after each beat of your day. Celebrate yourself all day long! Maybe you treat yourself to a nice meal or a happy dance or glass of lime-infused water or a walk around the block or a bouquet of flowers or a self-hug or a fist-pump and an “I did it!”. At the very least, put a hand to your heart and take in what you did. You wrote that email, you cooked veggies with breakfast, you didn’t yell at the kids, you planned supper before 5 pm, you planned out the next quarter, you told your father the truth. It can be anything. Take. In. What. You. Did. In this moment, that’s all that you really have. Those tiny moments will accumulate and gain momentum when you give them your attention, just as the shoulds usually do. 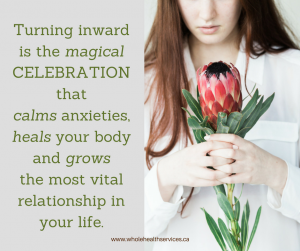 That’s when the magic of celebration shows its true power, in that it makes the overwhelm, the frantic thoughts, the fear-driven scramble disappear. Granted, there’s still stuff on the list – there will always be stuff on the list – but it’s now infused with ease. Heartbeat settles, shoulders drop, exhale. The true benefit of turning inward, of celebrating where you’ve been, is that it helps to ground you back into who you are. This is how you grow the key relationship in your life: the one to You. If you’ve lost sight of who You are in the sea of shoulds, let me light your way. I invite you to join a series called Spring into Celebrating You, in which I walk you through 3 rituals & explorations to (re)connect with that most fundamental relationship of who you are and how to feel at home within the needs of your body. If there’s one place that you deserve to be comfortable, it’s at home in yourself. Learn more about this basket full of essential garden tools right here. Welcome to my Online Home! Come for the food; stay for the conversation. Celebrate how YOU are enough! Join the Whole Health Dinner Party conversation to receive tips and soulful inspiration fresh to your Inbox every other week. Want more Food for Thought like this?